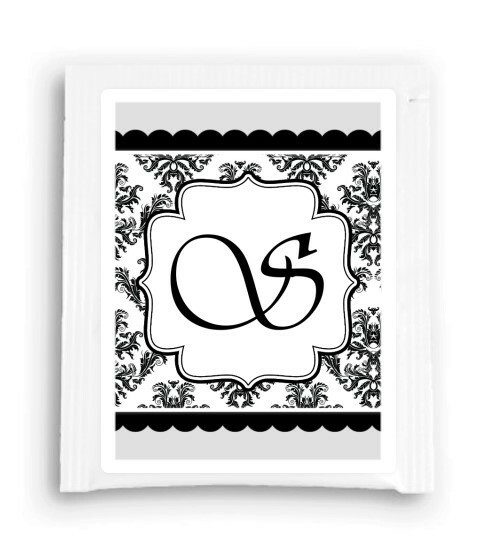 Our Black and White Monogram Tea Bag favors are perfect for your tea party / bridal shower. The customized labels are printed and affixed to the front of the white foil envelopes that hold tea bags inside. Tea bags ARE included! When you receive these, they are complete favors and ready to be used for your party! The tea bag favors offer you a stylish, personalized favor at a great low price. Each tea bag comes sealed inside a beautiful white gloss foil envelope (2.5"w x 3"h) to lock in the flavor and freshness of the rich traditional blend of black teas. Please allow 7 business days to fulfill your tea bag favor order; then add ship time. Shipping is a flat rate of $3.00.